Maria Dunn and accompanying musicians performed original songs about working in the plants and community life along with videos created by Don Bouzek incorporating excerpts from oral history interviews and images such as archival photographs and promotional material. Catherine C. Cole provided a brief historical narrative and there was an audience feedback session. The video ballad is a form of performance which mixes live music and video actuality to tell a story. Maria, Don and Catherine will use the oral histories and historical research as the basis of the creative process. Maria will select themes and phrases to develop into songs and write ten original songs. Don will pull together video clips and visual materials. Catherine will identify images and advise on historical authenticity. Maria will collaborate with musicians on arrangements and rehearse with the video elements. Toronto’s Jumblies Theatre organized a cross-country creative journey by train to connect community arts and heritage practitioners across Canada. A workshop incorporating Packingtown song and video was held during the Edmonton stop. 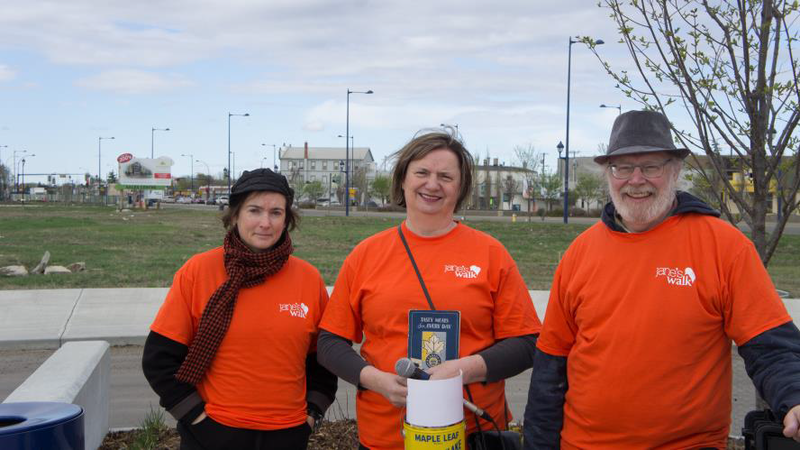 On Saturday, May 2, Jane’s Walk participants braved the cold to walk along Fort Road and into North Edmonton sharing stories about the area. Held the first weekend of May each year, Jane’s Walks give people the opportunity to get together to walk and talk about their neighbourhoods, past and present, in honour of the late urbanist Jane Jacobs. 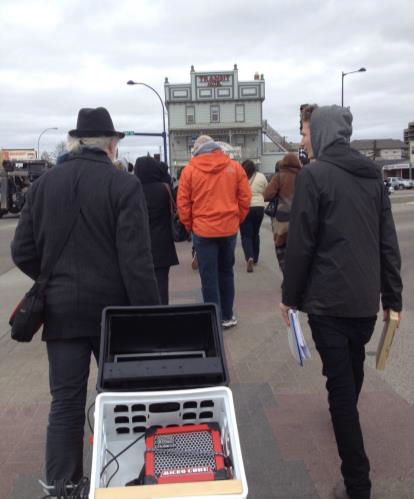 The walk led by Catherine C. Cole and Don Bouzek helped participants imagine what North Edmonton was like when the meatpacking industry was at its height and thousands of people worked at Swift’s/Gainers, Burns and Canada Packers as well as smaller companies and related industries, when Fort Road was a booming commercial district, and the community of North Edmonton grew around the plants. It featured a portable theatre, included video clips from oral history interviews and an original song performed a capella by Maria Dunn.